Synopsis: A fisheries expert is approached by a consultant to help realize a sheik’s vision of bringing the sport of fly-fishing to the desert and embarks on an upstream journey of faith and fish to prove the impossible possible. Review: With a title like Salmon Fishing in the Yemen, one might expect a visit to the Science Museum in St. Paul to accompany the screening. Well, despite the National Georgraphic-ish title and late 90’s UK romance feel, this is a perfectly charming and grown-up romance for those that like their films light and breezy. Taking on a role that seems like something Hugh Grant might have considered back in the day, McGregor makes for an interesting casting choice. 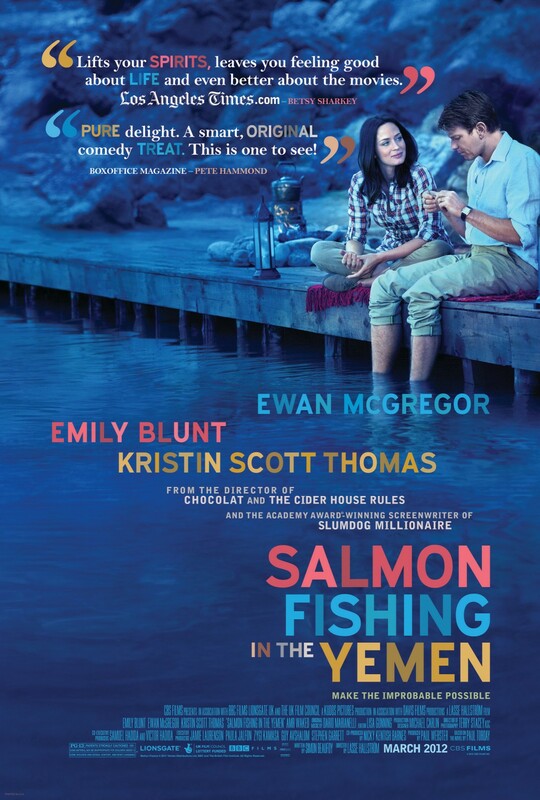 As a tightly wound scientist that is directed by the UK government to make nice with a businesswoman representing a sheikh that wants to introduce salmon sport fishing to the Yemen, McGregor tries something new and succeeds. McGregor uses his Scot accent for all its tartan glory and comes away with a bang-up character that is relatable and reliable. Blunt continues to light up the screen with not only her looks but her ability to make even the most mundane of situations appear important. She conveys so much with a look or a line delivery that in no time at all you are as swept away as McGregor is. Blunt always shines in these projects (she was tragically overlooked for an Oscar for her work in The Young Victoria) and here she makes her role about more than just having to choose between two men that are enamored of her. You get the feeling she actually is making a clear choice based on where she is in her life, rather than galloping ahead to a conclusion that is based on what the script tells her to do. There’s more to the relationship between Blunt and McGregor that is best left for you to discover, but let’s just say that the complications to their situation are timely and honest. Were this released before the end of 2011, I can’t imagine Scott Thomas not nabbing an Supporting Actress Oscar nom for her work as a foul mouthed, ballsy press secretary to the prime minister. She hasn’t had much opportunity lately to dig deep into her comic sensibilities, preferring to take on French language films instead…but her performance here is quite funny as she steals every scene in which she appears. Playing the sheikh in question, Waked brings a young Ben Kingsley vibe to his role and look which instill a trust and investment in his work. Similar good work is done by the remaining players – all of which are UK stalwarts from stage and telly. Director Hallström seems to have a knack for creating a real world feel from fanciful beginnings. From the oddball family in What’s Eating Gilbert Grape, to the story-book like world of Chocolat, and even to the little seen Hachi: A Dog’s Tale (um…if you see that movie…have a few Kleenex boxes on hand), he imbues a sense of trust to his films that is hard to achieve. Even though I felt like the plot was a bit predictable…the journey through the various rom-com milestones took unexpected twists that were welcome detours. More than once a character rises up to say something, you think you know what they are going to say, and they turn around and say something so totally honest that an emotional chord is struck before you are even aware it’s happening. That’s partly due to Hallström and partly due to Simon Beaufoy’s strong script based on Paul Torday’s novel of the same name. What ends up being delivered to us is a strongly satisfying mix of romance and comedy with a well-earned dollop of drama. Buoyed by strong performances and skilled direction, I was…ahem…reeled in by this one.